In the letter addressed to Haryana Chief Minister Manohar Lal Khattar, Hindu outfits from Gurugram demanded a ban on Friday prayers being read in open spaces. The protestors carried out the rallies against authorities demanding the withdrawal of a case registered by the police against 6 Hindu men for disrupting namaz in an open plot of Sector 53 on April 20. 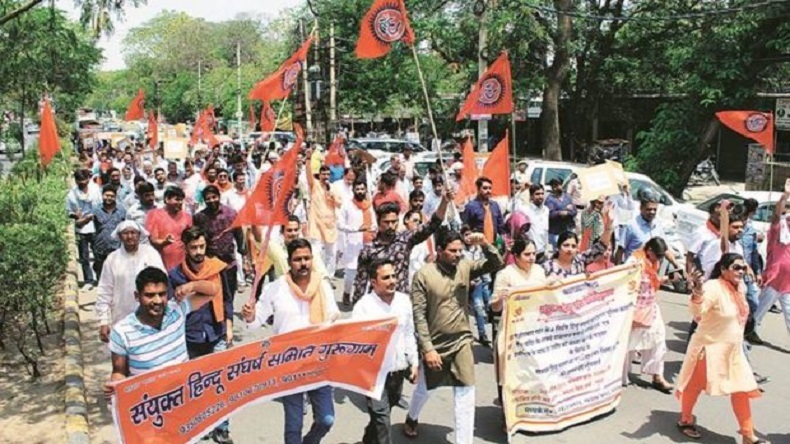 Several outfits, under the ambit of Sanyukt Hindu Sangharsh Samiti, carried out protest rallies against authorities on Monday morning, demanding the withdrawal of a case registered by Gurugram Police against 6 Hindu men for disrupting namaz, and a city-wide ban on reading namaz in open. Yesterday, April 30, police booked 6 men for disrupting namaz that was being read in an open plot of Sector 53 on April 20. According to government authorities, senior members of the outfits have also warned the officials to hit the streets on Friday to make sure than no one reads the namaz in open. At least 500 people were part of the rally that was carried out by Hindu outfits against the reading of namaz in open. The protestors gathered at Kamal Nehru Park around 10:30 am and marched to the Mini Secretariat and submitted a letter to the deputy commissioner Vinay Pratap Singh that was originally addressed to Haryana Chief Minister Manohar Lal Khattar. The protestors have alleged that people who read namaz in an open plot, had tried to occupy the land illegally on Friday. The protestors further accused that worshippers chant anti-India and pro-Pakistan slogans. The protestors also demanded the Haryana CM to identify the Bangladeshis and Rohingyas living in Gurugram. However, worshippers who have been gathering at vacant plot said that all these claims are false.